Ancient Egypt Magazine - Britain's only dedicated Egyptology magazine. The magazine features articles and book reviews on all aspects of Ancient Egyptian History, People and Culture of the Nile Vallery. The latest volume features articles on the Oriental Museum in Durham, which features how the collection was formed at looks at some of the more important exhibits. 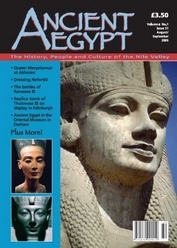 Other features include articles, on the parents of Nefertiti, the recreation of the replica tomb of Thutmose III for an exhibition in Edinburgh, the CT scan of Tutankhamun's face, the discorvery and restoration of a colossal statue of Queen Meryetamun at Akhmim, and the military campaigns of Rameses III as detailed in the temple at Medinet Habu.